The first thing that most people think of when they hear the term “permaculture” is growing food. That is the main reason people are drawn to permaculture. Growing food is still the most common use for permaculture. So Part 3 of this series will explore how native plants fit into a permaculture based food producing garden. Require the least effort once established. Usually have deeper roots, which allows them to extract nutrients and water from deep in the soil, reducing watering and fertilizing needs. Deeper roots also help retain the soil and water. Reduce the need for tilling the soil. Tilling kills wanted organisms, such as worms and nitrogen fixing bacteria, in the soil. Are reliable habitats for desired wildlife and insects, since they are present the year round. Large farms maximize the production of one given crop, with all of that crop being sold. Forest gardens are optimized to produce the most food of the greatest variety in the least space to meet one household's diet needs. As a result, forest gardens tend to be rather densely planted with a lot of diverse plants. Use of vertical space is optimized as well as horizontal, with different size plants sharing the same ground. Vines are encouraged to climb on the taller, stronger plants. This can make the forest garden look like an untamed jungle to those used to most North American gardens, where annuals are planted in separate nice, neat rows. But forest gardening has been sucessfully practiced for thousands of years in many parts of Asia, Africa, and South America. At first, the best path to this forest garden may seem to be using edible native plants. Many Florida native plants are indeed edible (references 1 and 2). Green Deane's “Eat The Weeds” website is one of the best sources for information on edible Florida plants, both native and non-native. Are richer and denser in nutrients. Are easier to grow and harvest. Coontie and palms are good examples of the problems with using wild plants for food. These plants do provide food that is rich in nutrients, But these plants also take at least a decade to get to a size worth harvesting. Harvesting the food portion from the plant kills the rest of the plant. Coontie also needs special processing to get rid of the toxins found in the edible portion of the plant. Wild plants would require far more land to meet one's diet needs than is needed for plants specifically bred for food. You would also have to get used to the blander or more bitter tastes common in wild plants. There are good reasons almost no one lives on a mostly wild plant diet anymore. 1. Wild edible natives can be used to add variety to your diet, for example, as spices and garnishes. 2. Native plants can replace non-natives that perform non-food functions in the garden. Examples would be as green mulches, nitrogen fixers, places for predator insects to feed, hide, and breed when their edible hosts are dormant, and to attract native pollinators. You may not want food plants beside your driveway or the street for fear of petroleum products getting into your food. Likewise, planting food plants by a pressure treated fence may result in the fence toxins getting in your food. You may want a buffer around your yard to keep your neighbors' pesticides and herbicides out of your food. When many older Florida houses (pre-1970) were built, Chlordane or DDT was poured around the foundation as a termite barrier. Consequently, you probably don't want food plants close to your foundation. Native plants would be ideal for these situations, especially if they also perform other functions, such as acting as windbreaks, shade, or host beneficial wildlife. My own yard has native plants, such as sunshine mimose, beach sunflower, and porterweed, by the street and my neighbor's and my driveways. Natives, such as firebush, wild coffee, goldenrod, and Simpson's stopper, also make up most of the plants around the edge of my yard by my neighbors' pressure treated fences. Native sages, mints, purslane, spiderwort, and rain lilies are some of the natives that are allowed to mix with my sweet potatoes, moringa, chaya, cassava, and Seminole pumpkins (a debatable native; present when the Spanish first arrived but probably brought here from elsewhere by the native inhabitants). I let my peas and beans climb all over my native beautyberries and palms. Part 1 stressed that permaculture is a design approach. Successful designs need lots of data on their potential elements. Since permaculture originated in temperate Australia and has been practiced to date mostly in temperate Australia, North America, and Europe, there is much data on plants for temperate climates. Since it was inspired and modeled after the forest gardens in the tropics, there is also a lot of data on tropical plants. But Florida's climate is subtropical. 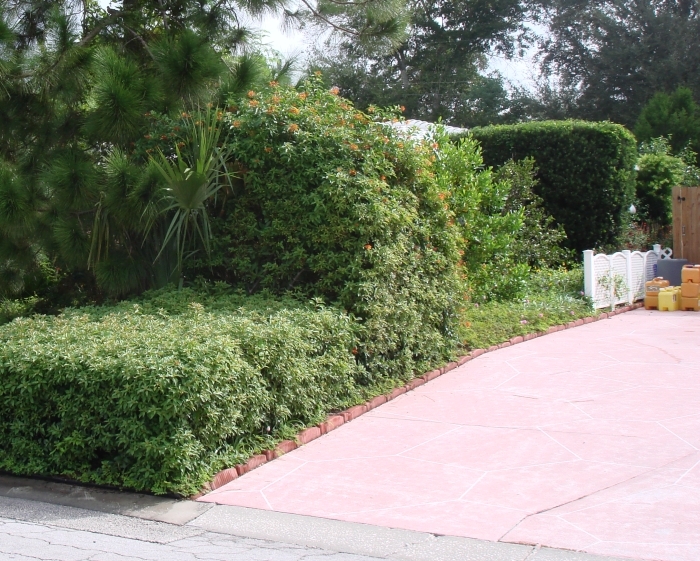 Many temperate climate plants can't survive the long, hot, and steamy Florida summers. These temperate plants also need more chill hours to bear fruit than Florida winters typically provide. Most tropical plants can't survive the occasional frosts we get. 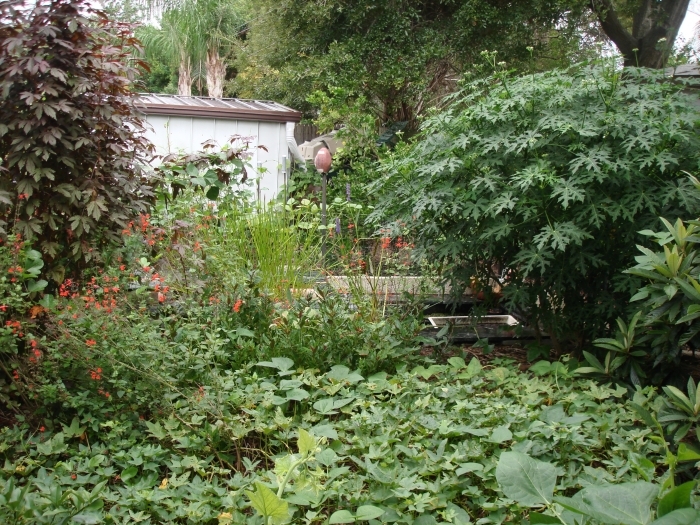 So people who practice permaculture gardening in Florida are exploring new ground. We still need to do a lot of trial and error to find out what works here. http://www.gaiasguardians.info/ provides some of the results of our studies and trials. Here, too, native plants may help us. They are already used to our subtropical climate. We may need to selectively breed the more promising natives to create versions that have better food qualities. This may even require us to cross breed these natives with exotics which already have desirable food traits. All this talk of exotics and selectively breeding natives may bother the native plant purists among us. But the most environmentally destructive exotic species here in Florida is us humans. Keeping Florida pure while importing our food from industialized farms thousands of miles away is not good for our planet. This present food system doesn't keep Florida pure, either, as seen by our own industrialized farms, phosphate mining, over-pumping of our aquifers, and debates over offshore oil drilling. If we are willing to accept us humans living in Florida, we need to feed these humans. The most earth friendly way to provide this food is as locally as possible. As our song “Rain Barrel Boogie” states, you can't get more local than your own backyard. Permaculture provides a way to grow this food in as small a footprint and with the least impact to the environment as possible. Reference 1: Deuerling, Richard J. and Lantz, Peggy S. Florida's Incredible Wild Edibles. The Florida Native Plant Society: Orlando, FL. 1993. Reference 2: Peterson, Lee Allen. Peterson Field Guide: Edible Wild Plants. Houghton Mifflin: Boston, MA. 1977. Figure 1 - A forest garden can look more jungle-like compared to traditional row gardens. Figure 2 - Native plant buffer zones keep toxins associated with roads, driveways, and fences away from food plants. © 2003-2013 Stone Marmot Enterprises, all rights reserved.